Virginia was one of the earliest states in the US that gold was discovered. Unlike many of the eastern states that are limited to only small amounts of glacial gold, extensive hard rock deposits have been found here. The majority of the gold that has been mined comes from a belt that is roughly 9 to 15 miles wide and 140 miles long that runs along the eastern side of the Blue Ridge Mountains, but additional mines are scattered throughout the state outside of that belt as well. A few small gold discoveries were found here as early as 1785, but small scale mining didn’t start until around 1804. For approximately 25 years starting in 1828, Virginia was averaging a recorded volume of 3000 ounces of gold per year, with peak years reaching over 6000 ounces. Mining continued in full force until the famous discovery of gold in California, when thousands of miners pulled up and headed west to search for their fortune. Mining in Virginia continued at only a small scale after that. During its peak, there were several hundred gold mines operating in Virginia. Today, most gold is found by small scale recreational prospectors. Gold can still be found in all the areas that produced gold in the past, with some of the best areas within the east of the Blue Ridge Mountains. All areas within the famous “gold-pyrite belt” have good potential for producing placer gold in the creeks and rivers. Focus on areas that have historic lode mining activity. Counties with significant gold mining history includes; Faquier, Culpepper, Madison, Orange, Louisa, Fluvanna, Buckingham, Cumberland, and Prince Edward Counties. One of the best known gold mines in Virginia was the Franklin Mine in Facquier County. There are numerous other lode mines that existed in the southeast part of the county. Other scattered hard rock deposits have been found throughout the state as far west as Carroll County and several mines in Dinwiddie County in the southeastern part of Virginia. Keep in mind that finding a rich deposit of gold takes time and research. 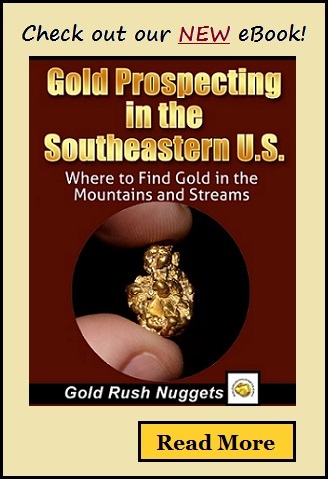 They call it “prospecting” for a reason; spend some time panning different areas until you find a rich gold bearing area. Once you are finding some good color in your pan, you should consider using some larger equipment so that you can process more material. Virginia is a great state to look for gold, and with the large amount of past mining activity there is a very good chance that a hobby prospector can recover some very good gold.